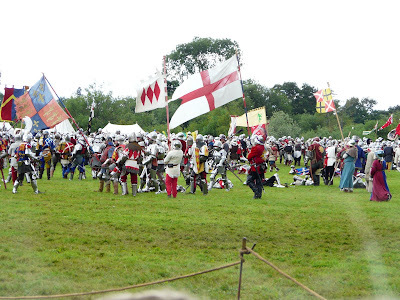 Both Saturday and Sunday saw the re-enactment of the Battle of Tewkesbury, fought originally on May 4th 1471. 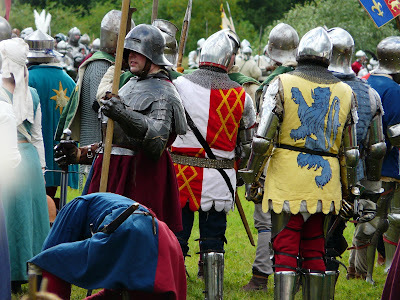 If you are interested in what actually took place, a brief account (including the names of the some of the nobility who fought) can be found on the Richard III site here (go to Wars of the Roses, then battles). The UK Battlefields Resource Centre also has some useful information on the battle here. Running the event itself is a massive operation. All the groups and individuals involved should be really proud of what they’ve achieved over the years (this year was 25th anniversary). 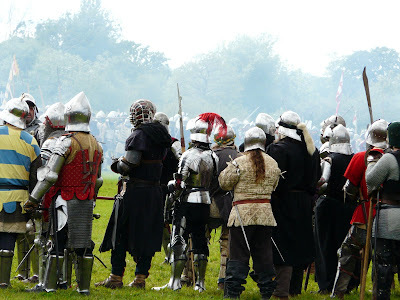 A special mention from me has to go out to the Plantagenet Medieval Society (my old re-enactment group – take a look at the low bandwidth option. There is a pic of me on the page – but I’m not saying which one!!) who played a huge part in the organisation of the battle. 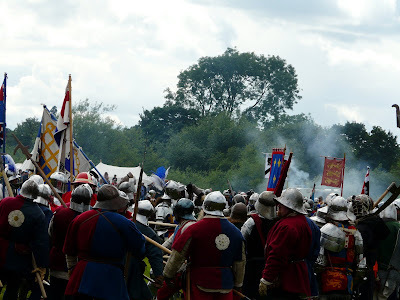 A company of pike men take to the field from the Yorkist side of the arena looking rather mean and nasty. 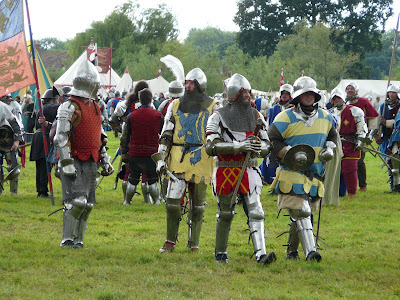 The usual odd mix of armour and head gear at Tewkesbury. Is that guy middle left an ancestor of the person who invented American football? 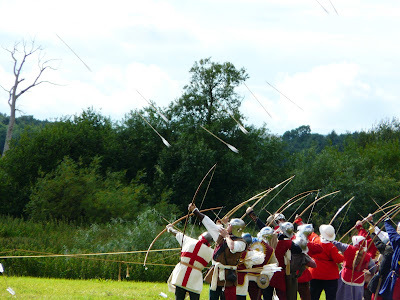 The Yorkist archers loose a volley of arrows at the Lancastrian forces. Don’t worry, they don’t have pointy bits on the ends (or they shouldn’t have, anyway). That doesn’t stop you from getting a nasty bruise if you are hit by one though! The battle in progress! 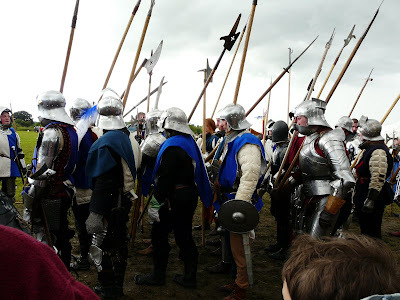 This gives an idea of the numbers of re-enactors taking part – and the headache for the organisers in getting them all safety-checked (no sharp edges on weapons!). Making sure that each section was co-ordinated to move where and when it should was no mean feat either. The ladies on the edges are supposed to be ‘camp followers’ but their main purpose was to provide water for any combatants who needed re-hydrating. Man down! Although this one got up again, there were a few casualties who got carted off the field in ambulances. Considering the nature of the event and the numbers taking part, there are always going to be a small number of minor injuries. Luckily it is rare that anything more serious occurs. Another shot of the close quarter battle. The smoke is from the cannons and muskets that fired off occasionally. 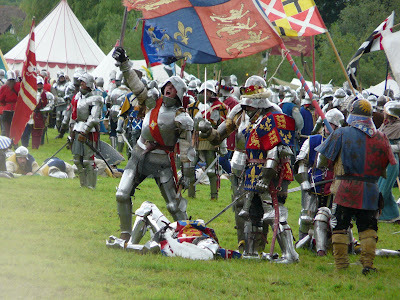 King Edward IV defeats prince Edward, son of Margaret of Anjou. In case you were wondering, the prince is on the floor and the king is the fellow on the right looking rather kingly! I don’t know who the chap on the left is but he looks rather happy! Hang on a minute… I know that coat of arms! Can it be…. can it really be….? Yes. 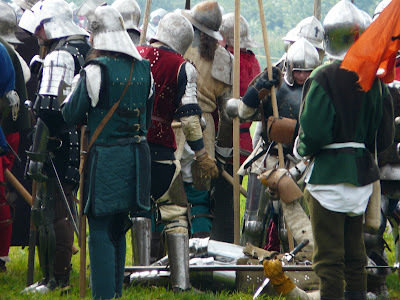 A Despenser at Tewkesbury battle!! On making further enquiries I discovered that it was actually Hugh the elder who had time-travelled from the 14th century with his own Lady D. and a few friends! Yes, I know that there probably weren’t any Despensers at the original Tewkesbury (unless they weren’t very well known) – but who cares. It was great to see that surcoat out there! Tagged re-enactment, Tewkesbury Medieval Festival. Bookmark the permalink. That was nice for Hugh the elder to come help out! Which side was he on? He was with the Yorkists and, as far as I could tell, grouped in with Richard! The bad guys sticking together, eh? Gabriele… you can run but you can’t hide… I WILL find you lol!! More great pics! Glad I wasn’t at the receiving end of one of the arrows though, even with no pointy bits! Hi Anonymous – and welcome! Will you be at Tewkesbury this year too? Let's hope the wether is as good as last year (altho I would imagine it was a bit too hot in that plate!). And fancy a Mortimer being on the same side as a Despenser lol!! Whoever would have thought! Nice to also see the Zouche arms there too! Thanks for your kind comments about the blog – as you can see my interest is primarily early 14th C but I always have loved Tewkesbury (especially as it’s just down the road from me! ).